How Much Does a Commercial Dumpster Cost? When you set up a contract for permanent dumpster services, it’s important that you make the best possible choice for your business. 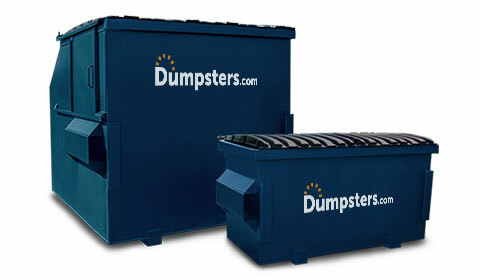 At Dumpsters.com, our team will put together a quote based on a transparent pricing model. Our commercial service representatives will walk you through everything that affects the monthly rate for your front load dumpster and what will be reflected on your invoice. To help you make a fully informed decision, we’ve outlined those factors below, but don’t hesitate to give us a call if you have any questions. What Goes Into the Cost of a Front Load Dumpster? Your business address will determine the dumpster sizes available for you to choose from. It will also affect the local disposal fees, recycling regulations, and labor and fuel costs associated with servicing your container. 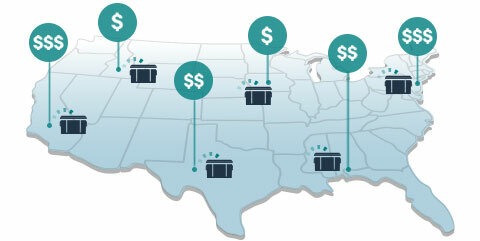 Routes for commercial service are designed based on fuel efficiency, with more remote locations requiring a higher transportation fee than those that are closer to an established route. The amount of material collected from your dumpster affects the total price. Volume is reflected by the size of your container, so larger sizes will have a higher price tag. We typically recommend a 2 yard dumpster for small-volume businesses or offices with less than 20 employees. The larger 6 and 8 yard dumpsters are better options for schools, retail spaces, apartment complexes and hotels. Please keep in mind that depending on how much room you have available for a front load dumpster, you may be limited as to what size you can order. How often your dumpster will be serviced is a major price factor. We offer weekly, biweekly and monthly pickup schedules. If you don’t have room for a big dumpster, we can schedule additional pickups to reduce the chance your container will overflow. Lock bars or wheels can be added to your dumpster rental agreement if desired. Please note that wheels are only available for 2 yard or 4 yard dumpsters. Lock bars are available for all commercial sizes and are recommended for businesses in highly trafficked areas. Lock bars prevent other individuals and organizations from using your dumpster, which helps you avoid fees for prohibited items that you didn’t throw away. We give you the option to update your pickup schedule as the needs of your organization change. Simply give us a call to modify the service frequency in your agreement, or to add an extra pickup to the calendar for a particularly busy week. With Dumpsters.com, our commercial dumpster prices won’t vary between billing cycles, and our contracts are shorter than many other providers. This balance offers you more flexibility as you plan for the future. You can also set your pickup schedule and will receive regular and on-time service with continuous customer support. If you need to update your pickup schedule or have any other questions about your dumpster rental, simply call our customer service team to make a change to your contract. Flat Rates: The base price of your front-load dumpster service will include disposal and servicing fees upfront and will never change during your contract period. Easy Billing: Our monthly invoices are complete, clear and concise, so you can give them a quick glance and file them away. Flexible Pickup: If you ever need an extra pickup, we’ll schedule it for you as soon as possible. Continuous Support: Our Commercial Services team will handle additional service requests for you at any time and answer any questions you may have about your ongoing service. 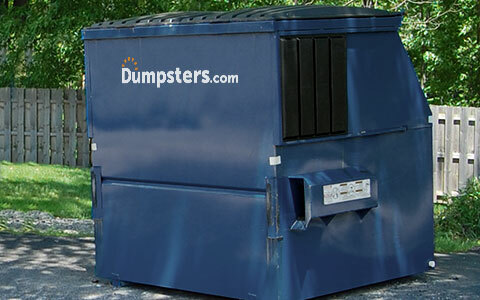 With consistent commercial dumpster prices, flexible service and a dedicated support team, Dumpsters.com is the partner you can rely on for your property or business. We work hard to keep your operation clean week after week, month after month. All you have to do is give us a call to get started at 833-499-7506.